Enable the Trace Port Interface as described in the STM32F103xx Reference Manual, chapters Pinout and Debug Port Pins and TRACE Pin Assignment. 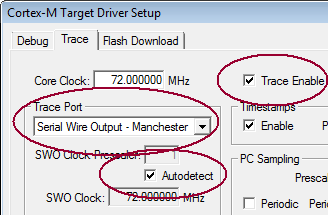 In the dialog Options for Target — Debug. Use the examples delivered with the Keil board MCBSTM32E as a reference.